Dr Zhao is a Senior Lecturer in Chemical Engineering in the Division of Chemical and Petroleum Engineering, School of Engineering. He is Course Director of BEng Chemical Engineering. 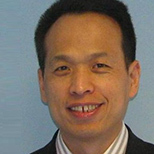 Dr Zhao has significant experience in teaching and research in UK higher education. After gaining his PhD at the University of Surrey, he worked there for one year before he moved to LSBU. In 2005 he joined the School of Engineering and Design at Brunel University, and moved to Department of Chemical and Environmental Engineering at the University of Nottingham in 2007. He returned to LSBU in 2011. Dr Zhao was actively involved in several Engineering and Physical Sciences Research Council (EPSRC) grants. His key areas of research activity are linked to fundamental research in heat transfer and mass transfer in reactors and multiphase flow in pipe and bends.